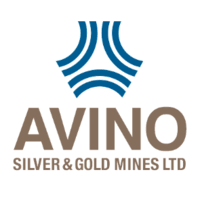 Avino Silver & Gold Mines Ltd. (TSX:ASM) (NYSE American:ASM) (GV6: FSE) is pleased to announce drill results from eleven holes that were drilled in the wall of the Avino Open Pit Mine area of the Avino vein stockwork system. The Avino Open Pit Mine area is located on the Avino property, situated 80 kilometres northeast of Durango, Mexico. Mapping by the mine geology team revealed shallow remnants of vein material on the margins of the open pit that had not been mined historically. Subsequently, during July and August 2018, eleven short diamond drill holes were drilled from surface into the footwall and the hanging wall to the main Avino Vein at the western end of the historic open pit. Mineralized material was intersected in a zone of stockwork and vein material less than 120 metres from surface. This has been provisionally named the ‘El Hundido Zone’. The stratigraphic relationship between this material and the zones currently being mined at depth in the Elena Tolosa “ET” Mine will be correlated with further work. The assays show a promising range of gold, silver, and copper grades at different widths, which warrant further investigation. “These drill results are encouraging and indicate the possibility of additional mill feed for Mill Circuit 4 in the future, and as we are currently in a low metal price environment, we are always looking at economical ways of running material through the Mill.” said David Wolfin, President and CEO. “Additionally, I would like to thank the operations team in Mexico for their continued initiative and focus on multiple stages of growth at the Avino Mine. These drill results are encouraging as the presence of mineralized material in the historic open pit mine area has the potential to add easily accessible mineable tonnage to our portfolio. The Avino vein is 1.6 km long and 60 m wide on the surface and has been followed longitudinally for more than 1,300 m and vertically for more than 600 m. It strikes north 66° east with an east-west splay, and dips to the south and southeast at 60° to 70°. Steeply dipping, high grade zones within the vein and stock-work zones are frequently found in the upper part of the vein, as well as at its intersections with a number of lateral veins. The Avino Vein has three main mineralized zones—San Luis, Elena Tolosa (La Gloria/Hundido) and Chirumbo areas—which rake to the west and are open at depth. The hanging wall of the Avino Vein is andesite, while the footwall is a monzonite intrusive with andesite sections. The mineralized zones of the Avino vein structure that are currently being evaluated were not economic 30 to 40 years ago due to the low metal prices at that time, however, with improved market conditions, modern efficiencies, advanced mining and mill equipment, the mining of these areas could now be cost effective. At the San Gonzalo mine, the Santiago vein dips steeply at 80° to the south and is oblique to the San Gonzalo vein (which dips 80° to the northeast). Recent development in the San Gonzalo mine has been focused on Level 2, which was originally drilled and sampled between 2007 and 2011. During the recent development, new mineralization was discovered and the possibility of vertical extension of known mineralization is being investigated by further development and drilling. Currently, we have approximately 2,500 tons of broken mine material, grading 350 grams per tonne Ag and 0.50 grams per tonne Au and are now drifting at Level 3 along the Santiago vein continuing to explore vertical continuity of mineralization in Level 2. Three diamond drill holes from underground have been completed and the assay results are pending. The long section showing the relation between the Santiago and San Gonzalo veins can be viewed by clicking here Map B or at the end of this release. The Company remains optimistic regarding the vast unexplored potential across the Avino Property which hosts dozens of historic shallow artisanal mines. Regionally, the Avino concession is situated within a 12 km north-south by 8.5 km caldera, which hosts numerous low sulphidation epithermal veins, breccias, stockwork and silicified zones. These zones grade into a “near porphyry” environment, particularly in the Avino Mine area. Following detailed geological and geotechnical logging, drill core samples are sawed in half. One half of the core is submitted to SGS Laboratory facility in Durango, Mexico, and the other half is retained on-site for verification and reference. Gold is assayed by fire assay with an AA finish. Any samples exceeding 3.0 grams/tonne gold are re-assayed and followed by a gravimetric finish. Multi-element analyses are also completed for each sample by SGS ICP14B methods. Any copper values exceeding 10,000 ppm (1%) are-assayed using ICP 90Q. Silver is fire assayed with a gravimetric finish for samples assaying over 100 grams/tonne. Avino uses a series of standard reference materials (SRMs), blank reference materials (blanks), and duplicates as part of their QA/QC program during analysis of assays. Information in this press release has been reviewed and approved by Michael O’Brien, P.Geo., Technical Director, Geology and Resources, Ausenco Engineering Canada Inc, who is an “independent qualified person”, as defined by Section 1.5 of National Instrument 43-101. Avino is a silver and gold producer with a diversified pipeline of gold, silver and base metals properties in Mexico and Canada employing approximately 500 people. Avino produces from its wholly owned Avino and San Gonzalo Mines near Durango, Mexico, and is currently evaluating the potential economics of possible future production at the Bralorne Gold Mine in British Columbia, Canada. The Company’s gold and silver production remains unhedged. The Company’s mission and strategy is to create shareholder value through its focus on profitable organic growth at the historic Avino Property near Durango, Mexico, and the strategic acquisition of mineral exploration and mining properties. We are committed to managing all business activities in an environmentally responsible and cost-effective manner, while contributing to the well-being of the communities in which we operate.